Amelia Hundley came into Nationals off of a successful outing at the Pan American Games. After a decent night on day one, it has been reported that she is withdrawing from competition with a slight meniscus tear. Updates will be added if more information comes out. Earlier, Hundley did an interview with Athletes in Action, where she talked about how her faith and family helped her work through injury as she prepared for the P&G National Championships. It seems she will once again need to rely on these things. The arena was ablaze with sparkling leotards as the juniors took the stage at the Secret US Classics. After an exciting competition, Lauren Hernandez of MG Elite topped the podium with a 58.45. Ragan Smith of Texas Dreams won the silver with a 57.70, while reigning national junior champion Jazzy Foberg of MG Elite followed behind her for the bronze with a 57.40. 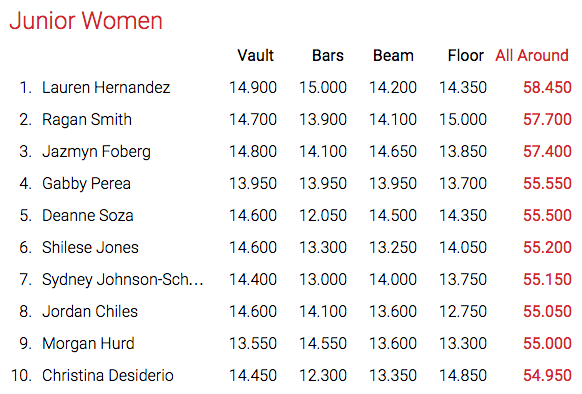 Hernandez led the entire meet, while Smith built up her scores with consistency and topped it off with a fantastic floor routine to take the silver. Foberg was also strong throughout the meet, however stumbles on her floor landings kept her just out of reach of the silver. Jordan Chiles went for her new amanar vault, the only junior attempting this difficult skill, but touched her hand down to prevent herself from falling backward. She ended the rotation in third with a 14.6. Ragan Smith also started on vault, scoring a 14.7 with a clean double twisting yurchenko. Grace Quinn tied her for second in the first rotation with a beautiful double twisting yurchenko of her own. 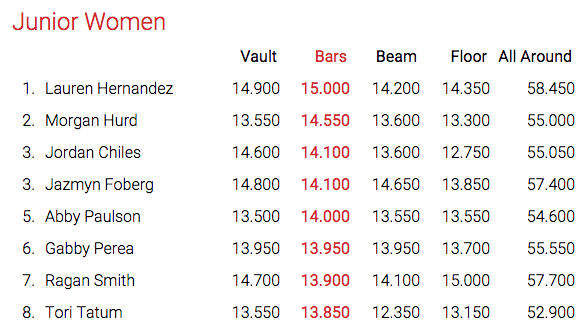 Hernandez started on bars as did reigning national champion Foberg. Foberg was up first, and floated through her 6.0 bar routine for a 14.1. 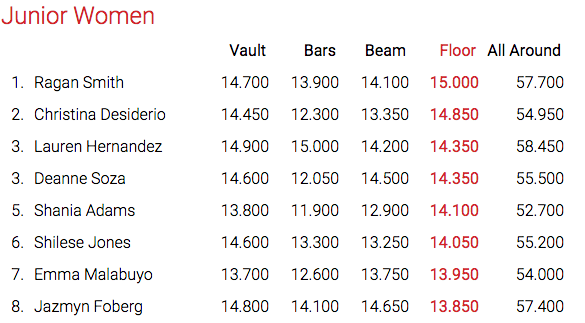 But Hernandez stole the show with her high flying releases and stuck landing for a 15.0, leading after the first rotation. 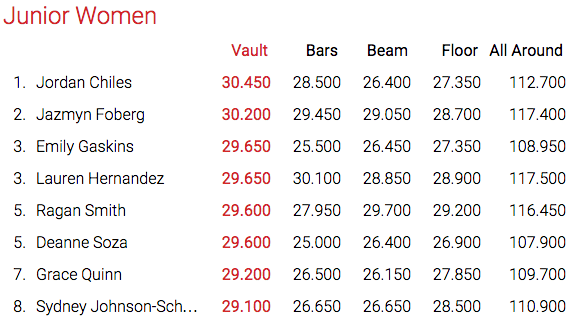 Jordan Chiles did a beautiful bar routine, but did not match Hernandez’s difficulty on bars and ended up with a 14.1. Foberg got through beam with just a few small wobbles, hitting her skills nicely for a huge 14.65, the highest score on beam to this point. Hernandez got up next, performing with her usual style and attack but had a large step back on her landing, leaving her with a 14.2. The rotation ended with Hernandez in the lead with a 29.2, Foberg in second 28.75 followed closely by Chiles with a 28.7. Ragan Smith in podium training. Photo by Christy Linder Sharp. 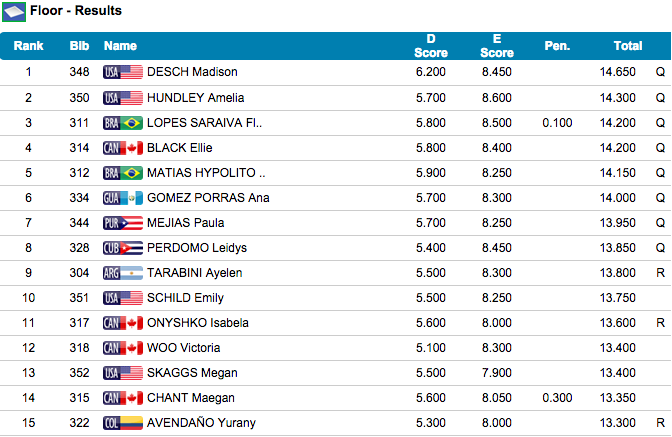 Chiles performed a beautiful beam routine, but fell on her back tuck. She finished the routine strong, but a 13.6 was low enough to just knock her off the podium at the end of the rotation. Foberg competed some impressive tumbling in her floor routine, opening with a full twisting double layout and a tuck double double for her second pass. She has some rough landings, and earned a 13.85, which was not quite enough to keep her in the top three. Christine Desiderio steped into the top three with the highest floor score of the meet at this point, earning a 14.85. Smith competed three solid routines in a row, and her consistency plus her incredible beam routine including a standing piked full earned her a 14.1 on beam moved her up in the standings. Hernandez wowed the crowd with her incredible floor performance, and was nearly flawless until her last pass when she stumbled back a bit and went out of bounds. However, a 14.35 kept her well in the lead. 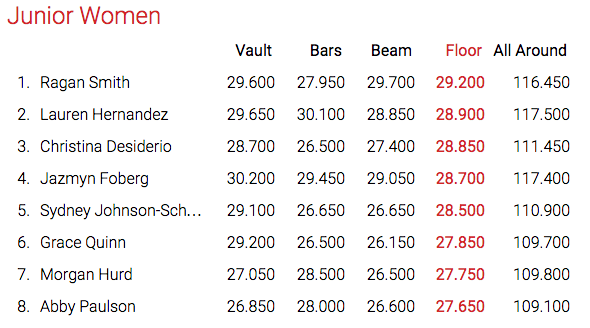 At the end of rotation three, Hernandez led with a 43.55. Ragan Smith moved into second with a 42.70. Desiderio was followed with a 42.65. Foberg and Chiles fell to fourth and fifth. Foberg and Hernandez side by side through it all. Photo by Christy Linder Sharp. Only four tenths separated second through fifth places heading into the last rotation, and the competition was tight. 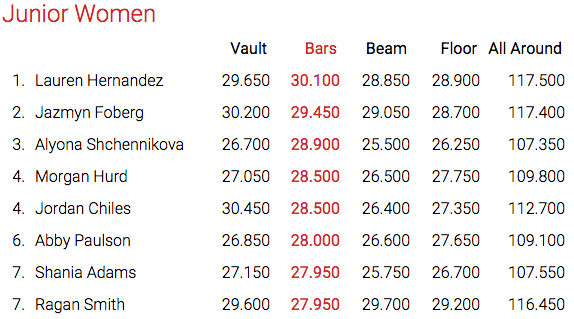 Foberg and Hernandez were on vault, usually highest scoring event. 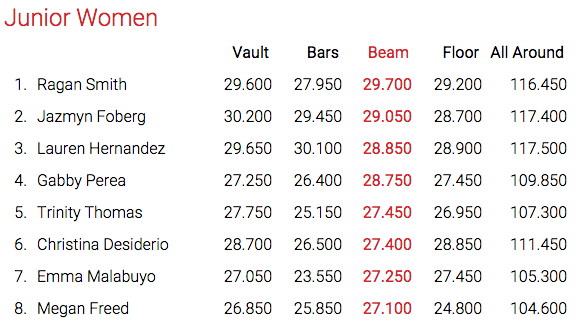 Smith and Chiles were on floor and Desiderio was on bars. 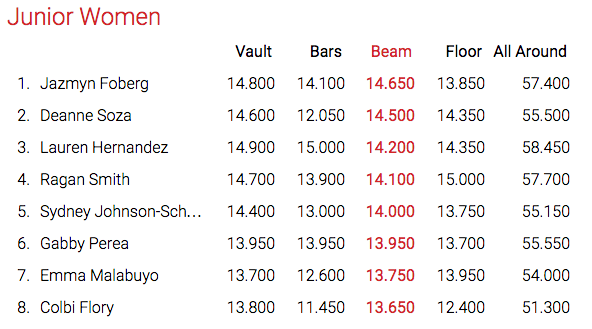 Foberg led off with a high double twisting yurchenko for a 14.8. 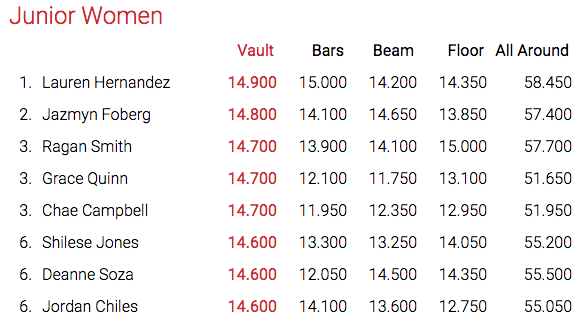 Hernandez did a clean double twisting yurchenko with a small hop, earning a a 14.9,the highest vault score in the meet and enough to keep her solidly in the lead. Ragan Smith took the floor with her charming and charismatic routine, opening with a sky high double layout, a one and a half stepout through to a triple twist, a double arabian and a stuck double pike. She scored the highest floor score of the meet, a whopping 15.0, which kept her in second place. Desiderio fell on bars, knocking her off the podium. Chiles finished up the meet on floor where she fell on her opening pass. She finished up well, but three falls in one meet kept her from the podium. Full Results at SecretClassic.com. 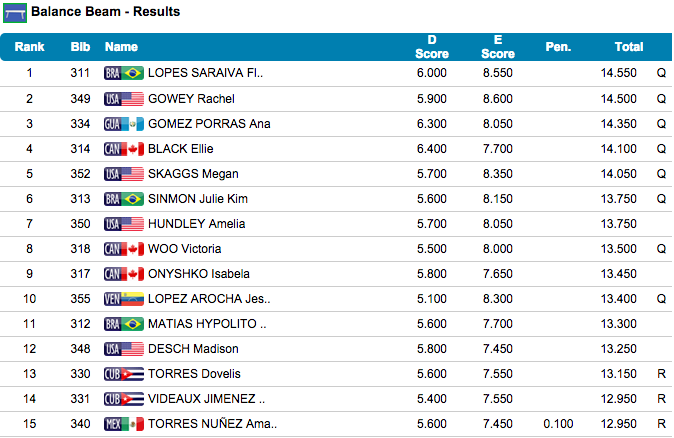 Top scores in the all-around and each event are below. Felicia Hano is injured on vault during podium training. Photo courtesy of Christy Linder Sharp. 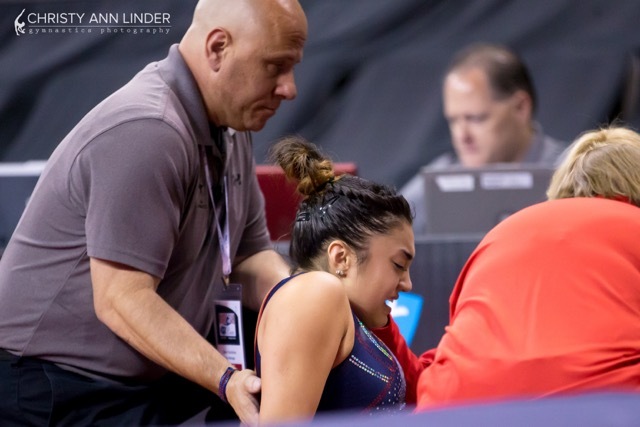 Felicia Hano, training partner with Kyla Ross at Gym-Max Gymnastics in Costa Mesa, CA, injured herself today during podium training for the 2015 Secret US Classics. Though no official update has been given, the most recent update of the start list for tomorrow’s competition no longer has Hano on it. The rotation was wrapping up and most of the gymnasts had left the vault. Hano remained, trying to get in a good vault after struggling through the rotation on her second vault. She was attempting a full twisting laid-out tsukahara. She landed short and immediately went down and rolled to her side, grabbing her right leg. Her coaches came to her aid and she sat up while they examined her. It is not yet clear what injury she sustained, though it is likely a knee or ankle injury. Hano, a former trampolinist, made her senior debut in elite gymnastics last year at the US Classics, where she placed seventh on floor and 10th in the all-around. She went on to the P&G National Championships where she placed seventh on floor. She was also selected as a replacement for the Pan American team last year and was added to the US National team. The 2015 Secret US Classics would have been Hano’s first competition of the year. This month’s National Team Training Camp include’s the initial selection for the team who will represent the USA at the Pan American Games (to be held in Toronto from July 10-26). 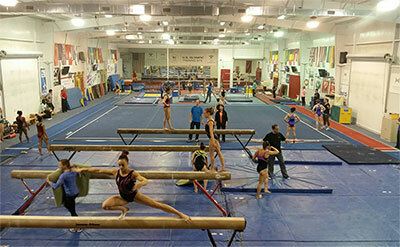 The five day camp ran this week at the Karolyi Ranch, and will culminate in the announcement of the eight-woman training squad for the games today at 1pm EST. The members of that squad will return at the end of the month, for the final selection camp to determine the five-member team. Training session at the June National Team Camp. Photo via USA Gymnastics. The gymnasts attempting to be be named to the Pan Am training squad spent the week finalizing the construction of their routines, and verifying these almost full routines with the National Team coaches. They also worked on continuing to refine their execution and artistry and testing their physical abilities. They will spend the rest of the month training at their home gyms to come back with full competition ready routines for the selection camp. The seniors in attendance who are not vying for the squad, as well as all of the juniors are at a different phase in their training. They only verified half routines, wanting to peak at full routine competition readiness closer to the National Championships. They also worked on execution and artistry, as well as physical abilities testing. The camp is headlined by five members of the gold medal winning 2014 U.S. Women’s World Team: Alyssa Baumann of WOGA; Simone Biles of World Champions Centre; Madison Desch of Great American Gymnastics Express; Kyla Ross of Gym-Max; and MyKayla Skinner of Desert Lights. Ashton Locklear of Everest and Madison Kocian of WOGA are still recovering from injury and was not in attendance. 2012 Olympic gold medalist Aly Raisman of Brestyan’s American Gymnastics is also at the camp, however Gabby Douglas had a slight foot injury and did not attend, but is expected to return at the end of the monthaccording to USA Gymnastics Facebook Page. Those not in attendance will have the opportunity to petition on to the training squad.